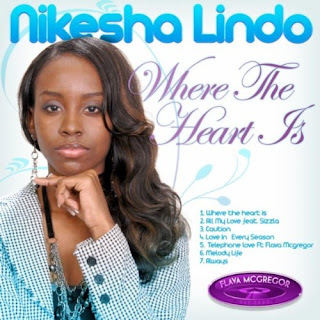 Caribbean Lifestyle Media: The daughter of legendary Reggae producer Willie Lindo, Nikesha Lindo recently released her new EP titled Where The Heart Is . Kemar Flava McGregor who produced the EP told us, "I played the rhythms so they could fit within the dancehall, or at the club," said McGregor. "You'll find that with a lot of these reggae lovers rock tunes, when you go to the club, the radio deejay has to speed them up for them to have a vibe. So as a producer, I made these beats uptempo. A lot of lovers rock grooves don't play in the clubs, because the vibe is too laid back. We just wanted to make sure that these songs fit into the selection, to play into the clubs, and to the dancehall, and not just on the radio, or in your car." McGregor who was introduced to Nikesha's talent by her father Willie Lindo decided to start working with the songstress in 2010. Nikesha collaborated with Sizzla on "All my love" talks about her writing style and intention behind making music. "I pretty much just write whatever I hear when I listen to the beat," said Lindo. "It just depends on the song I'm singing. When I write it, I normally try to record it right away, so that I can keep the intentions that I had when I was writing it. It pretty much depends on what the song is about, and what kind of feelings I have when I sing it. When I hear the rhythm, I sing what comes to my head, so there's not really any intention before I hear it."